New Yearâ€™s is a massive celebration we have been looking forward to for some time. Before We head off to the night club to party, before we pop that champagne cork, let’s take a few steps back. The New Year is not just a chance to party, it is also a time for starting over. Few of us really stop to contemplate the significance of the New Year. 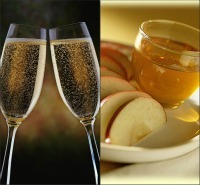 The self-improvement process that surrounds the Jewish celebration of the New Year, Rosh Hashanah, offer us an important opportunity for re-energizing, renewal and reflection that will help us in 2012. 10. Sound the alarm. One day can merge into the next and before we know it January 1st, 2012, will have come and gone. We slip easily into the same routines, the same lives, the same reality. We need to sound the alarm now so that we can prepare ourselves for this amazing opportunity at rebirth and renewal. 9. Heal damaged relationships. Each year we wrong someone close to us and sometimes this leads to an ugly falling out. Yet, we still love this person. We still care for them, but because of egos we canâ€™t admit fault and say we are sorry. If you ever wanted to reach out, but just couldn’t do it, now is your chance. You call and say. â€œIâ€™m calling to saw Iâ€™m really sorry. I really want that in 2012 we rebuild our friendship. New Yearâ€™s is a convenient time to make-up. 8. Self-improvement starts with personal responsibility. We all want to become better people and realize our potential in 2012. While we might hope that our New Yearâ€™s resolutions will stick, first we must recognize past mistakes and character flaws before we can hope for new resolutions to have a chance. When we own up to our shortcomings, we can truly become better people, realize our potential and have a chance for personal growth in the New Year. 7. Time for an accounting of the soul. Sometimes we are not even sure how to do the right thing. Sometimes, even when we know the good deeds that we could be doing, we are not sure how to start. On the New Year we can search our soul and see what is preventing us from initiating and expanding the good we do in the world. 6. Time for an accounting of the mind. How we think has such a deep impact on what we do. We jumped to negative conclusions, without giving people the benefit of the doubt. Perhaps we stood by when we could have made a difference, and are full of regret. We stayed in abusing relationships. We let negativity cloud our thoughts. As we prepare for the New Year we clean out our head-space from self-doubt and negativity. Giving charity, gifts, and loving kindness helps us actualize the positive impact we can have this new year. 5. Set realistic goals. Audits are exhausting. Now we know how far we have to go after doing these accountings. We want instant results. In our desire to repair our lives, if we start on all repairs at once, we can end up setting ourselves up for failure. Saints were not born overnight. Lives are not fixed in the tick of the clock. It can be harder to change one character flaw, than anything else we have tried. By first establishing attainable goals and then stretch goals we set ourselves up to succeed. 4. New Fiscal Year = New Spiritual Year. This past year we paid it forward sometimes, just not enough times. We were content with receiving when we could have been busier giving. Just as we start our financial year from scratch, we can start our spiritual bank accounts over. We have the chance to accumulate great spiritual wealth this year. 3. Celebrate that God has given the world another year. Our lives do not exist in a vacuum. We rejoice at this opportunity to start afresh, yet we also need recognize how our lifestyles affect the world around us. New Years offers us a chance to reflect on how we can live healthier lives in harmony with our surroundings. We have another chance in 2012 to start healing our lives and the planet. 2. Start on the right foot. We know we should always put our best foot forward, but with the New Year we suddenly forget that lesson. Thanks to a few drinks, we begin with headaches and in places that make us feel sick. Instead of with regrets, start the year with sweetness and joy by being with people who are a positive influence on you. Enjoy one an other’s company, with good food, sweet desserts, and a modest amount of wine. 1. Get more spiritual. The world around us is full of materialism, distractions, and the stress of making a livelihood. Consequently, we donâ€™t make enough time for prayer, ritual, contemplation, and being grateful for what we do have. In addition, we made moral and ethical mistakes that damaged or spiritual lives. This New Year, give your spiritual life a chance to really grow by opening a bigger place inside your heart, and fill it with spirit. When we resolve to lead more upright, and conscientious lives we can come closer to the Divine.